It seems like these days nearly every group bike conversation eventually turns to gravel. But if you’re one of the many people half-heartedly nodding along while quietly harboring inner dread, you’re not alone. Riding on gravel can be intimidating, but with the right bike set up and a good mindset, there’s nothing too complex to worry about. 2018 is the Year of Gravel, so you may as well get used to it, or you’ll soon find yourself missing out on a whole lot of group ride fun. To help you get started, here are five easy tips. Is your ride at least 25% gravel? And is some of that a descent? If so, it’s worth riding a gravel-ready bike. Depending on what you’re riding, you may not feel as nimble on pavement but you’ll feel much better on the gravel. Especially when descending. A gravel bike, sometimes also called all road, is a bike that’s well set up to handle gravel. It’s not a mountain bike, and it’s not a road bike. There are small tweaks and upgrades sprinkled throughout the bike that better handle rough conditions. A gravel bike will have a slightly lower bottom bracket and a longer wheelbase, to make it more stable over uneven terrain at higher speeds. Tires are usually 32mm or 35mm if not wider and often they’re tubeless. This allows you to run a lower tire pressure for better grip in a variety of surface conditions. All road bikes will typically come standard with disc brakes, too. Even if you’re not riding a gravel-ready bike, lower your tire pressure. This will allow you to better grip the surface and more easily maneuver through the gravel. It also makes for a less bumpy ride. Arm and neck fatigue from a rough surface is a major source of exhaustion on a ride that would otherwise be going just fine, so do what you can to keep your upper body comfortable. You’re going to be tempted to squeeze your breaks and freak out, or tense up from nervousness. Just relax. Let your bike glide through the gravel. Watch videos of people cruising through gravel, and draw upon those images as you’re crushing it. Just remember that you can do this. You got this. Just roll and glide through it. If your back wheel fish tails, keep pedaling. Momentum is your friend. Forward motion creates balance. Challenge yourself not to put your foot down and stop every time you feel ill at ease. Ride through it, and every mile gets easier. You don’t need to be all over the road, but find a nice solid looking line, the best path in the gravel, and follow it. Stare ahead, see what is coming, and be prepared. If there are potholes, washboard or a deeper wash of gravel, slowly move to a better line and follow it for a while. Most people ride gravel because gravel roads are where some of the most gorgeous scenery is – away from the cars and deeper in the landscape. Sure, you may be freaking out a little, but take the time to breathe and soak in your surrounding. Take some pictures, and enjoy the ride. Core strength is essential for maintaining a healthy bike body and we will always recommend it. A strong core will help prevent lower back pain, tightened leg muscles and upper body fatigue. When riding gravel, it also gives you the upper edge on stability, which goes a long way when riding on an uneven surface. 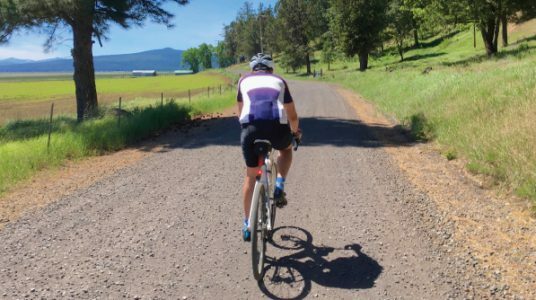 Looking to test your gravel legs? Check out Gravel by Cycle Oregon, October 5-7 with a base camp in the Tillamook State Forest.